A person’s name is the sweetest and most important sound in any language, according to Dale Carnegie. Clearly Mr. Carnegie would have heartily approved of personalization technology. Marketing personalization is different across every channel. Sometimes subtle, often jarring, the differences in using personal data in advertising, email, on websites, and via social media must be understood, or you run the risk of alienating your audience. 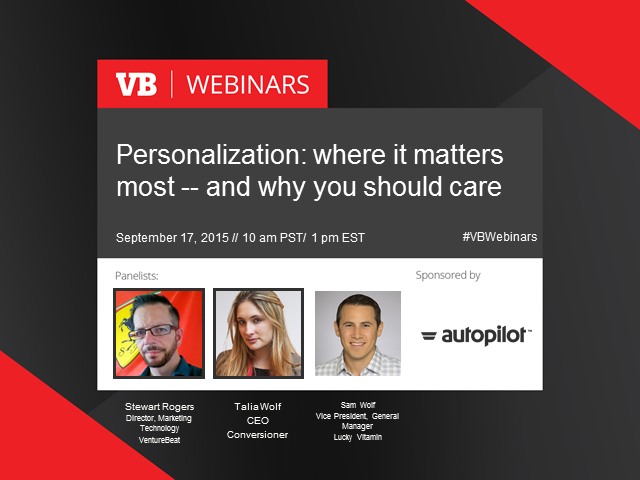 In this editorial webinar, Stewart Rogers of VB Insight will discuss the latest findings in Andrew Jones' study of marketing personalization. He'll be joined by several esteemed personalization experts who will add their knowledge, understanding, and actionable takeaways on everything from how to achieve personalization, through to the psychology of using personal data in marketing. * Find out why personalization matters, the psychology behind it, and why marketing channels change how you use personal data. * Discover the gap between what is possible, and what is happening right now, to help you understand the opportunity. Don't miss out! Register today for this live interactive discussion.